This is Resurrect Isis HOME PAGE. Navigation link to the Table of Contents HUB. The HUB has links to all pages on this website. All pages are linked back to the HUB. The Message here is UNIVERSAL LOVE. The Mission here is to BUILD A BETTER WORLD. The Argument here is that WE ARE ALREADY A ONE-WORLD-FAMILY. Their ancestral gods were their ancestors. They were all children of Mother Isis. Isis was a real person. She wasn't a just "myth." Isis was the true mother of the Egyptian royal bloodline and Pagan religion. She was the mother of the throne. Egyptian royalty, Egyptian religion, and Egyptian civilization all began from the womb of Isis. We all have one or more of the Pharaohs and Isis queens in our ancestry. At this late date, all of us humans on this planet have that one woman in our ancestry. We are already a 'World Family' of Mother Isis' children. Science will some day prove this but it hasn�t done so yet. That proof is coming from all the DNA studies that genetic scientists are doing. The "Evemerist" Pagan argument here is that the gods and goddesses of old began as real people. They weren't just fictional characters. They were loved and revered ancestors who were deified for their deeds and wisdom. Not all of the Pagan gods and goddesses were ancestors; some of them were nature deities. Paganism was a mixture of ancestor worship and "nature" religion. 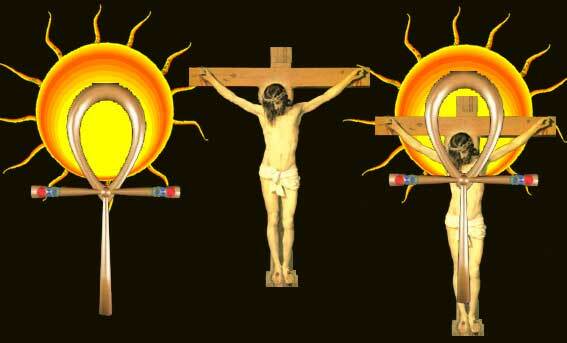 No one seriously believed that the sun god or sky goddess had human origins. Nevertheless, Osiris, Nephthys, Isis and Horus were real people. They were the founding parents of Egyptian civilization. They were just as real as George Washington and Betsy Ross or any of the "founding fathers" of American civilization. All of Pagan ancestry goes back to those four gods and goddesses. According to the foundation legend of Egypt, Isis resurrected Assur(Osiris) from the dead. She copulated with her resurrected king. From that union she begat their son Heru(Horus). Subsequent generations of Egyptian royalty traced their ancestral heritage to that event. Their belief in an afterlife, the construction of the pyramids, the state religion, and the royal genealogy of Egyptian ruling families forever thereafter all began from the resurrection of Assur. The divine kings of the ancient Pagan world ruled by �divine rights� because they were �descendants of the gods.� They all traced their genealogy to that miraculous event. Alexander the Great was in Egypt 2500 years after the alleged resurrection of Assur, trying to trace his own descent from those gods and not from the Greek gods. Western scholars have dismissed the entire foundation legend of Egypt as childish fiction and superstitious magic, but there is a lot of truth in the story IF it is recognized as an allegorical tale of events that actually happened and not taken literally. Isis didn't literally resurrect the corpse of a man who had been murdered and hacked into pieces. The ancient king who she allededly resurrected was probably dead for a thousand years before she "resurrected" him. Isis resurrected a culture. The resurrection of Assur was a religious and political renaissance. Via her womb, Isis reinvigorated the royal bloodline of kings of old who had fallen out of power and she reestablished a defunct religion that had fractured into a disarray of competing cults and conflicting ideolgies. The resurrection of isis is a labor of love.. This is not a scientific study. This is not a scholarly thesis. This is a synthesis of ancient history, myths, legends, art, and religious symbolism. The resurrection of Isis is a labor of love. The goddess Isis was once a real person. She was the ancestral mother of a world wide family of "divine" kings. Traces of that ancient mother goddess 'World Family' 'World Culture' civilization are still evident in the legends, languages, and cultures of civilizations all over the world. Militant monotheism demonized the Pagans and destroyed their civilization in a violent power struggle to gain control of Rome. This website endeavors to retrace that ancient mother goddess civilization and restore Isis to her rightful place in history. But more importantly, this website does not merely engage in retracing the past, this website is dedicated to fostering a 'World Culture' civilization of the future. We need to develop a 'citizen of the world' identity for ourselves. "Citizens of the world, unite!" The world of today is an anarchy of warring nations, predatory economics and captive populations. We need to create a multicultural 'World Culture' civilization based on respect and cooperation instead of predation and competition, a 'World Culture' civilization NOT governed by fear, greed, tyranny and war. The world is evolving toward a global civilization. Population pressure, global economics and the technology revolution are driving us toward a global civilization of some kind. There is a world-culture civilization of some kind in our future whether we want one or not. What kind of civilization will that be? The world population more than doubled in the last forty years and it is well on the way to doubling again in the next forty years. The established ways and institutions of a world divided up into nation states cannot bear up under the weight of that population. We need a new a new world order based on a world civilization idea, not on the fractured nationalism of today. The resurrection of Isis offers a way to do that. We can do that by recognizing that we are already a family of Isis' children. Confucius taught that when the family is in order, the world is in order. When our WorldFamily is in order, the world will be in order. Much of the fear driven political and economic strife will subside. Isis was the ancestral mother of the blood line of divine kings. The "divine kings" ruled by "divine rights" because they were "descendants of the gods." According to the foundation legend of Egypt, Assur(Osiris) was the first king of the first kingdom on earth. Isis resurrected Assur from the dead and copulated with her resurrected king. From that divine union she begat their son Ur(Heru)(Horus). That union was the beginning of the blood line of divine kings. The Pagan kings of old who ruled by "divine rights" all traced their lineage back to that union. The name Caesar contains the name Assur. C + Assur = Caesar. Alexander the Great was in Egypt 3000 years after that divine union seeking to trace his own divine ancestry from the Egyptian gods, not from the Greek gods. We're all royalty. At this late date, we all have one or more of those divine kings and Isis queens in our ancestry. We are already a world family of children of Isis. We cannot go back to the age of "divine kings," but a renaissance of Mother Goddess culture is the best possible path we have available leading to a peaceful and prosperous WorldFamily WorldCulture civilization in our future. See the Why Resurrect Isis? page on this website. Isis conquered more by love than by war. Isis was the Goddess of love. By her womb she conquered the world. Isis was a great powerful enlightened being like Buddha, Moses, or Jesus. A great 'World Culture' civilization was built upon her works, her teachings, and her womb. 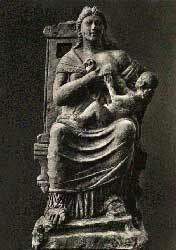 She was the ancestral mother of Pagans over the whole world. There was an ancient 'World Family' of Pagan kingdoms that traced their royal genealogy to Isis and the resurrection of Assur. In Egyptian art, Isis is pictured with a throne upon her head. She was the mother of the throne. The throne of Egypt passed down the female line of inheritance. Daughters of Isis married into the ruling families of the Pagan kingdoms all over the world. Via those Isis queens, Mother Goddess cultures spread from the Eastern Mediterranean over most of Africa, to Central America, Japan, Korea, China, and India as well as Russia, England, Wales, Ireland � and all of Europe. That was the Genesis of Isis. The hieroglyphic name for Isis contains a throne and an egg . She was the mother of the throne. The word genesis contains the name of Isis. Genesis = genes-of-Isis. See the The Genesis of Isis page on this website. Isis resurrected Assur from the dead. 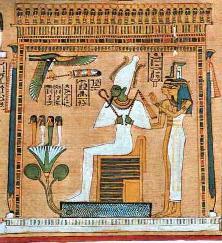 Egyptian religion, genealogy and civilization were founded on the resurrection of Assur(Osiris). The Isis legend is the foundation legend of Egypt. Yes, there were military conquests involved, but religion not war built the pyramids and the civilization that was Egypt. The legend of Isis grew beyond the real person. Her works and the events of her life acquired supernatural characteristics, but there was a real person behind the legend. She wasn't just a fictional character. The enlightened and long enduring civilization that was Egypt wasn't founded on the imaginary deeds of fictional characters. American civilization wasn't founded on the imaginary deeds of fictional characters. The legends of American heroes like George Washington and Daniel Boone have taken on mythical proportions, but they were real people. According to the Isis legend, there was an ancient king, Assur, who was the first king of the first kingdom on earth. A company of evil conspirators murdered Assur. They hacked his body into pieces, and scattered his severed parts. Isis gathered up the scattered parts of Assur and put them back together. She resurrected Assur from the dead and copulated with her resurrected king. 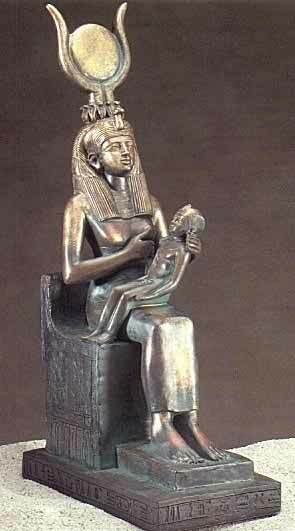 From that union, she conceived and gave birth to their son, Ur(Heru, Horus). Assur went on to become the King of Heaven and Judge of the Dead. Isis went on to become the Great Mother Goddess; she was the Pagan's "Eve." Heru went on to become the father of Pharaohs and the progenitor of the bloodline of "divine" kings. This much of the name Pharaoh (haroah) = Heru. Pharaoh = PHeru. The Isis legend is not fiction. No author created this story out of imagination or fantasy. The Isis legend is an allegorical tale. It is the history of Egypt of many generations condensed into a simple story that they taught children who had no written education. Isis didn't resurrect the corpse of a man who had been murdered and chopped into pieces. The resurrection of Assur was a religious renaissance. Isis resurrected an ancient fragmented and defunct religion. 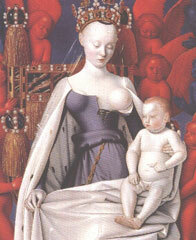 Via her womb, she reinvigorated the royal bloodline of a deified ancestor. That ancestor was the ancient ancestral patriarch "god" El. By one path or another, El was the ancestral father god of numerous civilizations. 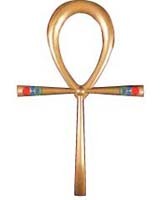 Our word royal(real) is composed of Ra, the sun god plus El, the legendary founder of the first civilizations. The name Israel means Isis Royal, the royal line of Isis. The name Israel is a compound of Isis, the mother goddess + Ra, the sun god + El, the ancient father god. The ancestral father god, El, was a prehistorical patriarch of date unknown. His legend goes all the way back to the first civilizations following the meltdown of the Ice Age. He and his descendants conquered and bred widely long before there were any written records. His legend was handed down by word of mouth through many generations in the form of heroic stories and wise sayings. Before Biblical Yahweh, El was the ancestral father god of ancient Syrian, Canaanite and Hebrew nations. El was a generic name for God. El-elyon: the most high God, El-shaddi: the all sufficient God, El-olam: the everlasting God, El-echad: the One God, El- hanne�eman: the faithful God, El-tsaddik: the righteous God, El-emet: the God of truth or the reliable God, Immanu-El: God with us. El was the Biblical El-ohim, Adam's father. El was the father of the Canaanite god Ba'al. Ba'al is a much reviled god in the Bible, but Ba'al means son of El, and Ba'al was the father god of the Canaanites of Abraham�s time. El-issa (El + Isis) was a wife of Ba'al. El-issa, in Hebrew means the wife/female of El. Ba'al and Elissa were the gods of Israel up until about 600BCE. "And it came to pass, when men began to multiply on the face of the earth, and when daughters were born unto them, that the sons of God saw the daughters of men that they were fair; and they took them wives of all which they chose. . . There were giants in the earth in those days; and also after that, when the sons of God came in unto the daughters of men, and they bare children unto them, the same became mighty men which were of old, men of renown." Genesis. 6: 1-4. El was the "God" whose sons saw that the daughters of men were fair. Following the meltdown of the ice Age (11-12 thousand years ago) our ancestors began turning to agriculture to supplement or replace their hunting and gathering economies. The early agrarian civilizations of the Mediterranean region all traced their ancestry back to the ancient father god El by some path or other � although not all of them used that name. Assur was an Egyptian version of the god El. Isis resurrected El from the dead. El wasn't Assur until Isis resurrected him. The resurrection of Assur was a religious renaissance; it was the restoration of a peaceful union of related kingdoms that had fallen into disarray, strife and war. The resurrection of Isis is a renaissance. It is the restoration of an ancient peaceful union of mankind that has fallen into disarray, strife and war. See the Egyptian Resurrection page on this website. The letters of our alphabet are Pagan religious icons from the legend of Isis and Assur. This website is a "synthesis of ancient history, myths, legends, art, and religious symbolism." The letters of our alphabet account for much of the religious symbolism used on this website. Contrary to conventional teachings and common belief, the letters of our alphabet are pictures. They are a set of Pagan religious icons derived from the legend of Isis and Assur. If Christian monks had invented the alphabet, it would be composed of Christian symbols which would reveal much about Christian ideology. Pagan scribes invented our alphabet. The Pagan pictographic alphabet reveals much about the culture that created it. The full set of alphabetic pictures that are letters of our alphabet are illustrated and explained on this website. The parts of Assur that Isis gathered for his resurrection have found their way into our alphabet. The D is his hand, O is his eye, the J is his beard, and so on. Parts of Isis are also letters of the alphabet. Human enlightenment didn't begin with education and the art of writing. There were enlightened individuals long before there was any kind writing. There have been enlightened individuals among us since far back in prehistorical times. El(Assur) was one of those prehistorical enlightened individuals. Buddha, Moses, Confucius, Jesus, Mohamed, and other historical figures rose among us in recent times. Their works and teachings were passed on in written language. 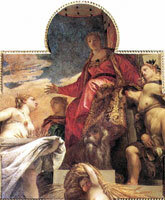 The works and teachings of the earlier 'great lights' were passed on in allegorical tales that are the stuff of legends. Isis was one of the great lights of the ages. Isis was born near the dawn of writing. Her legend begins in the era just before the dawn of writing and ends in the historical era of 'modern' civilizations. Her womb, her works and her teachings were the foundations of the first historical civilizations. There were earlier civilizations, but they didn't have written histories. The Genesis of Isis was a major force responsible for the spread of writing over the ancient world and for the creation of modern writing systems that are still in use today. So what? Why is it significant whether our alphabet is phonetic or pictographic? "One picture is worth a thousand words." Television is a more powerful instrument for communication than radio and print media are. The pictographic letters make words that are picture-words; they're pictures of their meanings. Picture-words make written language a more powerful medium of communication than writing just the sounds of the words do. See the Visual Language page on this website. 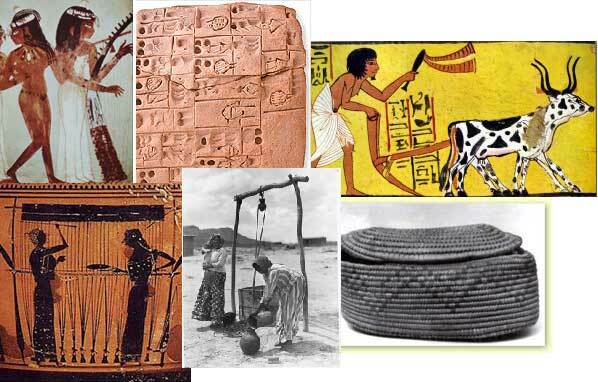 The Genesis of Isis and Pagan religion spread ancient crafts and industry over the whole world. Missionaries of Isis were the prime movers in the spread of agriculture, weaving, writing, languages, arts, and social order that made our civilization possible. Pagan religion was a mixture of genealogy, politics, religion, and education. It wasn't just a lot of snake worship and meaningless "idolatry." Pagan culture was the nearest thing to a universal culture that this world has ever known. The Genesis of Isis and Pagan religion spread the arts of civilization over the whole world. The engineering technology of well digging didn't have to be rediscovered by every village that had a well. The art of writing didn't have to be reinvented by every language that learned to write. Waves of useful technologies spread over the world from the birth of Isis like ripples on a pond. Weaving was one of the main industrial arts that accompanied the Genesis of Isis. "Daughters of Isis," who were 'pedigreed' descendants of Isis, were married as gift wives into the ruling families of 'World Family' of Pagan kingdoms over the whole world. Those daughters of Isis went on to become the ancestral mother goddesses of various Pagan cultures around the world. Isis, the Great Mother Goddess was a serpent goddess. The ancestral mother goddesses of wide spread cultures around the world were serpent goddesses who were credited with the invention of weaving. See the Illustrated Alphabet V page on this website for a further discussion of "Daughters of Isis." There are remarkable similarities between Amaterasu, the imperial mother goddess of Japan, and Ixchel, the ancestral mother goddess of the Maya in Central America. 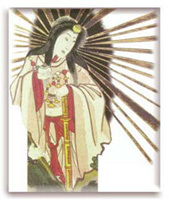 Amaterasu was an accomplished weaver, with many attendants who joined her in weaving the stunning satins, silks, and brocades for which Japan is famous. The complex huipiles and brightly colored tzutes were traditional textiles of the Maya. Tourists in Guatemala today cannot help but notice that the most obvious sign of Maya identity is the distinctive clothing of the indigenous population. Amaterasu and Ixchel were both sun goddesses who hid from the sun. They both were mother goddesses of advanced civilizations. They were both serpent goddesses who were the inventors of weaving. Their respective genealogies include closely similar names of related deities despite their great ethnic differences, and the great difference in their respective languages. See the Isis in Central America page on this website. Evolution was a fundamental part of Pagan religion. Pagans of the Isis bloodline didn't have a "theory" of evolution. They accepted it as a self-evident fact that humans had risen from lower primates. The Pagans regarded wisdom as the main characteristic that separated humans from the other animals. Pagan religion was wisdom religion. Pagans of the Isis bloodline were trying to improve human civilization and to improve humanity as a species by breeding a line of more intelligent humans from an original genius woman. That is how Great Mother Isis became the Pagan's Eve, and the model for Biblical Eve. The Goddess Isis was twice-wise. She was the goddess of double-wisdom. She was the goddess of fertility and the queen of heaven. 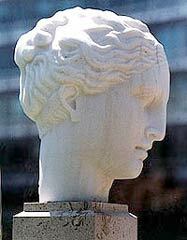 Twice-wise Isis was the Great Mother Goddess of Pagans over the whole world. The name Homo sapiens sapiens is not a scientific term. It began as a term to designate descendants of Isis who were twice-wise. (Humans who are twice-wise) are descendants of Isis. Homo sapiens sapiens now includes all of the people on this planet. We are all children of the Great Mother Goddess, Isis. See the Pagan Evolution page on this website. Isis was deified as a goddess for good reason, but it had a dark side. The throne atop her head and the babe at her breast identify Isis as the founding mother of the Egyptian kingdom, Pagan religion, and the bloodline of "divine kings." Her bloodline founded Egypt and other great civilizations. Her religion was annihilated and her followers were brutally suppressed, partly because she was a woman, but mostly for political reasons. The reign of the Mother Goddess challenged the warrior classes of ancient societies all over the world, but it also had a dark side. The title Caesar contains the name Assur (C+Assur = Caesar). The patrician fathers of Rome were Pagans of the Isis bloodline which made them "descendants of the gods." 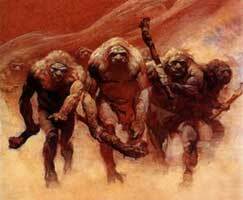 Their descent from the gods gave them "divine rights" to rule. Their Isis bloodline was the source of their legitimacy as hereditary rulers. They became absolutely powerful and completely corrupt. The Roman empire ruled the world for the benefit of a few elites. Monotheists were engaged in a political power struggle to gain control of the Roman Empire. The monotheists who were not descendants of the gods, who were not "patricians" of the Isis bloodline, had no hereditary claims to political power. The monotheists had powerful motives to eliminate the Isis bloodline as the only path to political power. Those Roman patricians of the Isis bloodline were some of the original "highbrows." They had the high foreheads and parted eyebrows that set them as a race apart from, and above, the people they governed. They were alarmed because the Temple of Isis was spreading the Genesis of Isis to the lower classes. The patrician fathers couldn't bear the thought of commoners and slaves being of the same divine bloodline as themselves. Pagan Roman royalty had little interest in protecting the Temple of Isis from the monotheists. It served their interests to see the Temple destroyed. The monotheist conquest of Rome was a long and brutal revolution. The Temple of Isis was trying to breed the masses up out of their ignorance and misery. In so doing, the goddess of love placed herself in the middle of a war in which both sides had an interest in her destruction. Before Rome fell to the monotheists, Pagan emperors paid lip service to protecting the Temple of Isis, but they did nothing. They allowed the Temple to fall to the monotheists. All that is left of Isis' Mother Goddess religion today is submerged in Christianity. The name Jesus contains the name Isis (J+Isis = Jesus). Jesus was a Pagan. The name Jesus clearly identifies Jesus as a minion of Isis. The resurrection of Jesus is clearly based on Egyptian religion and the resurrection of Assur. Jesus had no connection to Judaism other than shared opposition to Roman military occupation of Egypt/Syria/Palestine/Judea. His teachings of love are clearly derived from the teachings of Isis, the Goddess of Love, not from Jehovah, the jealous and wrathful God. Following the Deuteronomic reforms in the kingdom of Judea, (c. 620-609 BCE), militant monotheism launched a two-thousand-year campaign of destruction to annihilate all traces of the Mother Goddess. In the Bible, the womb of the Great Mother Goddess has been ripped from the genealogy of humankind and replaced by Adam's rib! The Jews rewrote their own history all the way back to their origins to cut their mother out of it. For fifteen-hundred-years in the Roman Empire, any peasant who found a Pagan artifact brought it to the village priest who chanted appropriate curses over it and destroyed it. The Goddess and her works have been grossly misrepresented and distorted in history. She has been unjustly exiled into the darkness of ignorance and "mythology." She is sadly unknown and unappreciated by us all. Isis was the EarthMother Goddess. She is the ancestral mother of all people who have two eyebrows. Monotheism was able to destroy her temples and erase her legend from the living memory of humankind, but they couldn't erase her sign. Today, we are all wearing the mark of Isis in the middle of our foreheads. It is right there at the part between our eyebrows. We are all Homo sapiens sapiens, "twice wise" children of Isis with two eyebrows. We are a WorldFamily of EarthMother's children. Once we recognize who and what she was, and realize who and what we are, we will be able to lay aside our family squabbles and build a WorldCulture civilization that leaves out no part of humanity. There was a brief "Golden Age" when the kingdoms of the Pagan world were relatively at peace. Militant Monotheism destroyed that ancient world order of Pagan kingdoms and established a world order (or world anarchy) of nation states which has resulted in a world at war without end. There was a global 'World Family' civilization in our past. There will be a global civilization of some kind in our future. Globalization is happening whether we want it or not. What kind of civilization will that be? Will we be guided by wisdom, or will we be ruled by authority? As a civilization and as a species, we must re-acquaint ourselves with the global civilization in our past in order to make wise choices about the global civilization of our future. We can create a multicultural 'World Family,' 'World Culture' civilization based on wisdom and cooperation, or else a police state monoculture based on fear and authority will be forced upon us. Can there can be a Golden Age of world peace in our future? Yes, it is possible. "Citizens of the world, unite!" Let us return to our Pagan roots. Resurrect Isis. Let this be a Golden Age. Resurrect Isis. Her message is love. Let world civilization begin. Send e-mail to: Resurrect Isis. Please include the name "Home Page" when responding to this page. This is the hub of this website. Links to all pages are here. All pages are linked back to this page. This is the "Mission Statement" that explains the scope and pupose of this website. These fully illustrated pages trace the letters of our alphabet to their Egyptian origins. Pagan Evolution Pagans of the Isis bloodline didn't have a "theory" of evolution. They accepted it as a self-evident fact that humans had risen from lower primates. 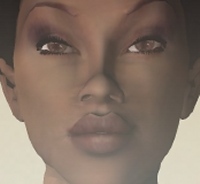 The Genesis of Isis The Genesis of genes-of-Isis to all of humankind was a human engineering project that accomplished results in a few thousand years what would have taken natural evolution hundreds of thousands of years � or maybe never � to accomplish. The Ice Age The meltdown of the Ice Age was the great event that led to human civilization. Isis in Central America The Genesis of Isis went everywhere. Mesoamerican civilizations began with the arrival of missionaries of Isis from the Mediterranean. The Egyptian Resurrection Assur was the original "Christ" who rose from the dead 3000 years before Jesus. Visual Language Our Roman alphabet is not purely phonetic; it is also pictographic. This visual language discussion explains the source of the pictures that are letters of our alphabet and the principles of their use in formulating words.